The Samsung 960 Pro has been the undisputed king of M.2 NVMe solid-state drive (SSD) since it launched last year, but it might finally be dethroned by Adata’s fastest gaming SSDs. 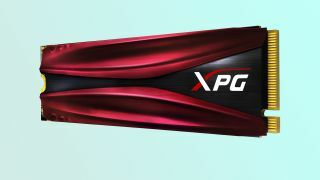 The Taiwanese electronics firm has introduced a new XPG Gamix S11 PCIe Gen 3x4 NVMe SSD featuring 3,200MB/s read and 1,700MB/s write speeds. That’s pretty quick and nearly as fast as the Samsung 960 Pro that operates at 3,500MB/s read and 2,100MB/s write speeds. Adata was able to achieve nearly the same level of performance by utilizing a 32bit DRAM data bus. Through Intelligent SLC caching, the storage drive can use its DRAM cache buffer to accelerate sequential and 4K random read/write speeds. Basically, the drive is using a tiny portion of much faster computer memory to push faster data transfer speeds. The XPG Gammix S11 also comes equipped with a custom-designed heat sink to maintain operating temperatures that Adata claims will be at least 10 degrees Celsius lower than a non-shielded M.2 SSD. The component maker will also be releasing a non-shielded version of the S11 as the XPG Gammix SX8200 that comes at some incredibly affordable prices. The XPG Gammix SX8200 240GB drive will set you back $139 (about £100, AU$180), 480GB of capacity costs $259 (about £180, AU$340), and the 960GB model is priced at $309 (about £220, AU$400). Adata has yet to say how much the XPG Gammix S11 will retail for, but we can't imagine it'll be very far off in price. Overall, you’re looking at a drive that costs half as much the Samsung 960 Pro while being nearly as fast.